with buyers offering the full listing price,” Yun added. There will be food, games and entertainment. Natick's Bookmobile will be there as well. Please note -- the children's parade has been moved to July 4, before the main parade. Have You Had a Meal at The Bone? Octane Bar & Grill? You may have eaten at both. Spike TV this month gave both The Chicken Bone and Angry Ham's Garage new names, menus and decor. Stop by and check out the "new" establishments yourself. Two local restaurants/bars this month were given a full makeover, thanks to Spike TV. Last week, The Chicken Bone closed for 48 hours and re-opened as The Bone. Saturday night, the Angry Ham's Garage closed and reopened Monday night as Angry Ham's Octane Bar & Grill. Spike TV was in town for two weeks filming two episodes of its new series Bar Rescue, which gives failing nightlife establishments one last chance at success. The new reality TV show will have its premiere Sunday, July 17, at 10 p.m. There is not an air date yet for The Bone episode, although there was talk of August. There is no air date yet for Octane either. There were lines of people oustide of both The Bone (June 18) and Octane (June 27) looking to see how the establishments had changed. Many in line were hungry for the new menus. The Bone still serves its signature chicken wings. Part of the makeover, included a new $10,000 fryer, which in many patron's opinions made the wings plumper and jucier. Chicken wings are also served on new trays, which capture the bones via a hole underneath the tray. And the beer taps were improved so the beer is between 8-10 degrees colder, said one of the producers. Angry Ham's Octane Bar & Grill still served burgers and pizza, but added a Signature "Ham" Burger, which features an 8-ounce Angus burger topped with a thick slice of maple ham, cheddar and Boston Baked beans on a toasted ciabatta. Patrons were enjoying wings and also the new Nitrous Fries, a tower of hand-cut fries layered with green onions, pepperoni and mozarella. The thin crush pizza is created your own with 8-inch, 12-inch and 20-inch sizes. Lots of appetizers to choose from, but if you can't decide there is a sampler called The Oil Change Platter, featuring four of them. For dessert, there is just one on the menu. Called a Doughnut Burnout with Mocha Grease, it features chocolate and yellow-glazed doughnuts stacked up like tires with scoops of vanilla ice cream and drizzled with coffee-chocolate sauce. Too much for one person, but great for four women to share. Regulars at both establishments gave mixed reviews on the decor. At The Bone, many were disappointed to see the mural gone. (It was taken down but not destroyed, according to the owner.) At Octane, regulars and newcomers were pleased with the new wall murals. On reveal night at both places, many regulars were unhappy with the bright lights, due to TV filming, no sports on the television, due to licensing issues, and no live bands or music playing, again due to licensing issues. At The Bone, a new floor was installed. That was a hit with everyone. Octane had new retro, red padding added to its existing wooden booths—a hit with everyone. Both locations have new logos and signs, to go with the new name. The Bone, features a silhouette of a blue chicken playing a trombone. Octane has a pig in a roadster, but a much gentlier pig caricature than the one it opened with about a year ago. Patrons loved the new light fixturs at Octane, as well as the retro gas station pump in the middle of the dining room floor. Bar area patrons liked that bar was pretty much the same and many commented on the giant waitress caricature on the outside of the building. What’s the best time of year to fertilize my lawn to keep it healthy and green? Answer: The optimal time of year to fertilize your lawn is actually the time of year that you’re putting away your lawn mower. As the air temperature begins to cool, the grounds stays warm enough to inhibit optimal intake of nutrients. To help you remember each year, plan to fertilize near Labor Day and your grass will be hardy and healthy for spring. Enjoy a paddle down one of the most beautiful stretches of the Charles River, past Medfield State Hospital and up into the Medfield marshes. Watch as the sun sets over the river and listen for the evening sounds of birds, frogs and other creatures. Pre-registration required. WALTHAM, Mass. – June 7, 2011 – The Massachusetts Association of REALTORS® (MAR) reported today that the number of single-family homes and condominiums put under agreement in May went up over the same time last year. This is the first year-over-year increase since December 2010. Condominiums were up one percent, for the first year-over-year gain since April 2010. On a month-to-month basis, the number of both single-family homes and condominiums put under agreement were up from April. The number of single-family homes put under agreement in May was up 2.1 percent compared to the same time last year (4,663 homes in 2010 to 4,760 homes in 2011). This is the first year-over-year increase since December 2010. On a month-to-month basis, single-family homes put under agreement were up 12.5 percent from 4,230 homes in April. This is the fourth straight month-to-month gain. The number of condos put under agreement in May was up one percent compared to May 2010 (1,894 units in 2010 to 1,905 units in 2011). This is the first month of year-over-year increases since April 2010. On a month-to-month basis, condos put under agreement were up 13.7 percent from 1,676 units in April. This is also the fourth straight month-to-month gain for condominiums. Rain or shine, Natick Rotary's annual Tour de Natick will roll through town for the eigth year in a row this Fathers Day to raise scholarship funds for graduating Natick High School students and internships for students at Wilson and Kennedy Middle Schools. The ride, which has raised $100,000 for students since it began, will travel through Natick and surrounding towns this Sunday, June 19. The 25-mile expert ride will begin at Natick Common at 8 a.m. and the six-mile family ride will begin at 11 a.m. Participation in the event costs $49 for the family ride, including mother, father and all chilren and $50 for the individual expert round. Following the ride, there will be a cookout at noon with folk music, burgers, hotdogs, macaroni and cheese, sodas and watermelon. Enter the raffle for a chance to with an Apple iPad-32G. Natick Recreation and Park's nine-week concert series on Natick Common begins Monday. The Natick Recreation and Parks Summer Performing Arts Series presents Concerts on the Common with the Cocabanana Band performing the first concert of the season. Pack up a picnic, and bring your family to the Natick Common, at the corner of Routes 27 and 135, on Monday, June 20 from 7 to 9 p.m. The Cocabanana Band will play music from the Caribbean. More information about the band can be found on their website. 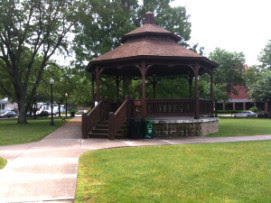 The Rain Date is scheduled for Tuesday, June 21, from 7 - to 9 p.m., on the Natick Common. “The Monday Night Concert Series is a 9-week series that has been running for as long as I can remember,” said Jon Marshall from the Recreation and Parks Department. “There have been a number of great bands over the years mostly all coming from the Metrowest Area." August 15 - 3 of a Kind, New Summer St.
Sound engineer, Peter Thompson, who has over 10 years of experience, will setup the music to fill Natick Common. Natick Pegasus will record the concert series for TV viewing. The shows will be featured on local cable access a few times throughout the summer. The Charles River Rotary will be selling concessions, including hot dogs, chips, soda and water and what Marshall calls “the best popcorn in the state.” All of the money raised by the Rotary during the concert series will go to the many charities the group has donated to throughout the years. The Natick Police Department and auxiliary officers have been working with Recreation and Parks for many years to help get people safely to and from the event. Veteran's Acupuncture Care MetroWest, Framingham Elks 1264 and the Parks and Recreation Department are inviting the public to a Flag Day Celebration at Cushing Memorial Park today, rain or shine, at 11 a.m. A a color guard will lead a silent walk. Scouts will lead the crowd in the pledge of allegiance. The public is invited to meet at Cushing Chapel inside the park, where there will be a short Cushing Memorial Park history talk. At 11:30 a.m., flags will be planted at the 9/11 Memorial. Afterwards, the public is invited to stay for a hotdog cookout. The Framingham Teachers Association's two teams are among the 80+ teams participating in this weekend's Relay for Life at Bowditch Field. More than 750 participants will raise more than $120,000 for the American Cancer Society. There are more than 750 participants and 80-plus teams who will participate in this weekend's Relay for Life at Bowditch Field in Framingham. The event is expected to raise more than $120,000 for the American Cancer Society. The first Association team captained by Kristine Parker, a first grade teacher at McCarthy Elementary, has raised almost $2,500, according to its website. Parker's co-teacher in a first grade inclusion classroom Jen Jenkins raised the most for her team with more than $1,000. Other members of the team include Will Cook, Karen Dauer, Ann Marie Graff, Rosemary Jebari, Andrea Lewis, Laurel Martin, Deborah Sandler and Marjorie Sisitsky. The second Framingham Teachers Association team is captained by McCarthy Elementary teacher Nicole Karpierz. Team members include Lori Brockway, Anne O'Donnell, Michaela Schult and Carol Skaggs. "We wanted to do something in the community. The cause to raise money to fight cancer inspired everyone," said Parker. "We wanted to rally together as an organization for a cause," said Parker. "Many on our teams have been touched by cancer, be it a loved one or a friend." Opening ceremonies are at noon. Many Relays for Life open with a Survivors Lap, where survivors lead the way around the track while being honored and applauded by all participants. Being a part of the Survivors Lap allows survivors to celebrate what they’ve overcome while inspiring and motivating their community to fight. Survivors are proof that cancer can be defeated. The teams will be there for 24 hours. There are fun events and special laps scheduled throughout Saturday and Sunday. The public is invited to come between noon and until the completion of the Luminaria ceremony. ﻿American Cancer Society Relay For Life is a life-changing event that gives everyone in communities across the globe a chance to celebrate the lives of people who have battled cancer, remember loved ones lost, and fight back against the disease, according to a press release from the society. At 8:30 p.m. there will be a Luminaria ceremony. Presently the top fundraising team, participating this weekend, is Hot To Trot, which has raised more than $16,000. The team is walking in memory of Jo-Ann Becker, who recently died from ovarian cancer. That team is co-captained by Joanne Jones and Paula Kane. Becker was a Natick resident. This weekend's Relay for Life is for people with connections to Framingham, Natick and Sherborn. The Framingham firefighters also has a team. Volunteers waited for thunderstorms to pass and endured the heat Thursday to set up the Vietnam Memorial Wall, which just arrived in Natick and will remain on the Natick High School practice soccer field until June 12. Volunteer Cary Holmes said since it was announced that the wall was coming to town, he received an outpour of people in town looking to donate their time. Holmes said there were roughly 270 people who volunteered to read the names of the 58,400 men and women who gave their lives during the Vietnam War. The names were recorded on tape on Natick Pegasus and will be on file for years to come as a part of Natick's oral history. Among the volunteers who read were WCVB TV personalities Susan Wornick and Harvey Leonard, town officials, war veterans, eight Natick High School students, a 9-year-old child and other members of the community. The opening ceremony begins at 6 p.m. Thursday at the wall. RISMedia, June 8, 2011—(MCT)—A portable herb garden that you harvest year round is a cook’s best friend. Herb gardening in containers helps achieve that convenience, whether you grow them on a windowsill, patio or balcony. Let your imagination take over when considering what herbs to grow in containers. Just about anything works, but most varieties prefer well-draining soil. Select a container with good draining holes and you’re set to grow. If you’re looking for style as well as practicality, use a Mexican strawberry pot. You can grow a bunch of different herbs in it and when you need some flavor for your food, it’s all right there—a one pot stop. Also, the pot must fit the plant, or plants, that grow in it. If the container is too small, herbs quickly become root bound. If the container is too large, plants spend all of their energy on root production and not grow the way they should. You can’t just dig up little dirt from your garden and think you’re done. Ordinary garden soil is too heavy and dries out too quickly. Instead, you want soil that is loose so it drains properly. You can purchase a quality potting mix, or you can make your own. A popular mix for container grown plants can be made by combining equal parts of potting soil, peat moss and perlite (or vermiculite). While most herbs require little fertilizer, you do need to pay closer attention to container grown plants. Because the amount of soil around the plant is limited to the size of the container, it dries out fast and requires more nutrients than soil in your garden. For herbs, usually all that is needed is a good all-natural fertilizer, including Bonnie Plant food or Espoma organic fertilizer. You can also make your own compost tea by seeping a porous cloth bag of compost in a bucket of water for about 24 hours. If temperatures are warm, a container may require water once or twice a day. Watch closely, and water when the potting mix appears dry and pale, or has shrunk away from the sides of the container. Also, poke your finger in the soil. If it feels moist, it’s all right. If it feels dry, start watering. Keep in mind that many herbs prefer dry conditions. The essential oils that give herbs their flavor and aroma are produced most when they receive plenty of light. For best results, most herb varieties require at least six hours of sun per day. If growing indoors, many plants do fine on a south facing windowsill. If the amount of light is not enough, you can supplement light with fluorescent lamps or grow lights, especially during the winter months. Having herbs in containers makes it easy to move them to a sunnier spot or move them to a more sheltered location. Question: When we had our kitchen remodeled about 11 years ago, we had a ceramic-tile floor installed. The floor is very durable; however, the grout is about one-eighth of an inch below the surface of each tile. Little did we know that this space would become a trap for collecting spills and debris of all sorts. Can we fill the remaining area with grout to eliminate this problem and make it level with the surface? Answer: I would say no. The rule with grout lines is to have them all at a consistent depth of at least halfway down the thickness of the floor tiles installed. In addition, the old grout cured 11 years ago. The new grout would not adhere to the old grout, and you’d be cleaning broken bits of it off the tile floor instead of cracker crumbs. I suppose you could remove all the old grout and replace it with new, but that’s more work than just regularly cleaning and sealing the tile and the grout lines. You also can damage the tile while removing the grout, and there’s no guarantee it will adhere to or even reach the underlayment, which is part of what the existing grout is sticking to. Have you ever grouted a tile floor? I have done several, and every time the opportunity arises to do another, I go into hiding. To help prevent gunky grout, vacuum the floor regularly, using the tool that allows you to get into narrow places. To actually remove stains, you can try a household cleaner such as Mr. Clean, Lysol, or baking soda (no chlorine bleach on colored grout) mixed with water, and let it sit for a while to work. If these cleaners don’t work, try OxiClean, which has oxygenated bleach. Scrub the grout with a brush that is stiffer than a toothbrush but softer than a metal one, and do it periodically. Regular maintenance keeps small problems from getting bigger. Q: We recently bought a home that has charcoal slate flooring throughout the kitchen, dining room, foyer, and hall areas. The flooring has years of accumulated liquid wax buildup. The wax has paint splatters and stains that make the floor and grout look dirty, and the buildup around prior furniture placement is evident. Is there a stripping agent or any other way to bring the slate back to its natural, matte finish? A: Stone flooring websites note that there are safe strippers available, and you might go to a home center or hardware store to ask what their specialists recommend. Once that is done, use an acrylic-based finish to restore the shine. Q: How do I remove a pocket door to repair the rolling hangers? A: You need to first break the paint seal along the stop moldings on the jamb of the door, and then take the moldings off carefully with a prybar. To remove the door, situate it in the middle of the doorway. Then tilt it toward you and remove the rollers. Q: Does it help to keep the heat-pump fan on manual setting to circulate air or should it be left on automatic? A: Nothing I’ve read seems to indicate that one way or the other matters, but if you left the house for a day in the winter on manual setting, it might take a lot to get the heat back up to a comfortable level. The automatic setting would keep the house at a correct level without much sweat. The HVAC system we have has the air-conditioning set at 76 degrees, and it kicks on when it exceeds that temperature. We don’t have to do anything. For more information, please visit www.philly.com. RISMedia, June 6, 2011—(MCT)—In the United States, the 2010 Census brief shows that the median age of Americans is now 37.2, with seven states—Maine, Vermont, West Virginia, New Hampshire, Florida, Pennsylvania and Connecticut—recording a median age of 40-plus. And the University of Florida says nearly 16 million Americans are trying to balance work and elder caregiving responsibilities just as the number of older people is about to skyrocket. A study by the National Alliance of Caregiving/AARP estimates businesses next year will suffer a $29 billion loss in productivity due to elder caregiving demands. It’s the flip side of the childcare demands of workers 20 years ago. It means we all have a job to do. At every age. We need to stay healthy and productive. We can’t sit around and expect others to pick up the slack for us. If we do our job well—and if we have the right genes—we can be active and interesting and contributing members of society until well over 100. Which is an amazing concept! Last week, I went to a PBS and AARP presentation of the documentary “After 90 and Loving It.” The program is airing as part of the spring 2011 lineup on public TV stations. Is this the Boomer future? I hope so. For 57 minutes, we saw people in their 90s and 100s who are living what must be dubbed “extraordinary and passionate lives.” Filmmaker Susan Polis Schultz interviewed them all—from folk singer Pete Seeger (who gets his exercise splitting cords of wood) to Nola Ochs, who received her master’s degree three months before her 99th birthday. One of my favorites, Katie Brown, 91, drives to her job in a mall each morning where she readies cinnamon rolls for sale. Laura Simon, 101, is working on the second book about her life, while Granny D (Doris Haddock), who walked across the country 10 years ago as a political activist, remains involved and unstoppable. Then there’s Harry Rakoff, a New York cabdriver at 94, and Les Lieber, 96, playing his saxophone for Jazz at Noon every Friday in a New York club. This is a great study of the positives and benefits of an aging society. And while we’re all not as physically capable—even at a younger age—of many of these nonagenarians, they force us to admit there is little to keep us from improving with age. And I don’t mean by sitting on a shelf. • Maintain a positive attitude and focus on the positive. Don’t worry about anything. • Embrace maturity. Don’t think about how old you are. In fact, forget about it. • Keep doing things. Work hard following your passions. • Stay curious about the future but stay engaged in the present. • Don’t focus on yourself. • Keep physically active and maintain a healthy lifestyle. • Choose to be around people who are positive. • Avoid people who are negative. • Don’t be afraid of death. Think of it as it is — something very natural and inevitable. Good points to reflect upon. And reflect I did—through gritted teeth—as I drove myself and two other ladies of more advanced years to the library event. They told me where to turn. They blamed someone else when they sent me in the wrong direction. They said, “Just turn on your flasher and wiggle like you want to change lanes,” when I needed to move over on the freeway. They even pointed out where I should park, at the clearly marked handicapped spot. Some day—sooner than I would like—I will be of the age of these two. And if I am careful and do as I’m told now, I’ll still be on the streets and byways. They’re physically and mentally active. They’re positive ladies. They’re not focused on themselves. They are engaged community volunteers. I try to ignore the obvious—they could “volunteer” their driving information to someone else. But we got there and back. “I’ve never had so many back seat drivers,” I said. Which is another point about aging. Clearly these women see the world differently than their boomer daughters do now or will in the future. Does that mean no more backseat drivers? I’m doubtful. Meanwhile, I’m turning on my blinker as usual, when I want to change lanes. Some parts of our lives are not age related. Jane Glenn Haas is the founder of WomanSage. For more information, visit the Register at http://www.ocregister.com. By Tom Kelly, Wednesday, June 1, 2011. Home prices were down nearly 34 percent at the end of March from their pre-recession peak in 2006, according to the latest Standard & Poor's/Case-Shiller National Home Price Index. Still, more than 80 percent of adults say that buying a home is the best investment a person can make. Two recent nationwide studies -- one by the Pew Research Center and another by real estate website Trulia -- revealed that not only do consumers prefer to buy than rent, but buying is more affordable than renting in 78 percent of the nation's cities. The Pew Research Center surveyed 2,142 adults between March 15 and March 29, 2011. The survey sample included 57 percent of respondents who own a home and 30 percent who are renters. The remainder has other arrangements, such as living with family members. The study found that 37 percent "strongly agreed" and 44 percent "somewhat agree" that homeownership is the best investment a person can make. When this same question was asked two decades ago in a CBS News/New York Times survey, 49 percent" strongly agreed" and 35 percent "somewhat agreed," the Pew study revealed.